Unfortunately the European Union’s proclivity to back the Eritrean government is apparently undiminished. This cartoon, from 2009, makes clear that it has happened before. Despite President Isaias’s long-standing unwillingness to improve his country’s human rights diplomats are keen to find a way to work with the regime. Little, if anything, seems to have been learned since them. How did the Eritrean regime respond to previous attempts at ‘engagement’? The European response to Eritrea has developed over many years. It should not be forgotten that Europe supported the Eritrean people even before the de-facto independence of the country in 1991: especially during the 1984 – 85 famine, when European countries were major donors. Cross-border operations fed millions who would otherwise have starved. Since de-jure independence in 1993 was ratified by the United Nations, Europe has attempted to build a relationship with the Eritrean government. This has not proved easy. Under President Isaias Afewerki, Eritrea has become one of the most inward looking, repressive of states – a fact attested to by numerous reports from Human Rights Watch and Amnesty International. In 2001 there was a generalised clampdown on all forms of opposition. Independent media were closed and senior government officials and journalists – the “G-15” – were arrested and disappeared from public view. They have never been formally charged, much less tried, and have been held inceeommunicado. Among those in detention is Dawit Isaak, a Swedish-Eritrean journalist, arrested in the 2001 round-up. The EU has repeatedly called for his release and for EU representatives to actively take up his case. When the arrests took place the Italian Ambassador to Eritrea, Antonio Bandini, presented a letter of protest to the authorities. He was promptly expelled and other European ambassadors were withdrawn in response. The EU presidency said relations between the EU and Eritrea had been “seriously undermined” by the government’s action. Even when it is not beset by these kind of problems, providing aid to Eritrea has proved notoriously difficult. Most aid agencies were forced to leave after a law was enacted by the regime to control their activities in May 2005. This required NGO’s to pay taxes on all goods imported into the country and prohibited international agencies from engaging in ‘development,’ surely among their core activities. As time passed the EU re-assessed its relations with Asmara. Although there had been no sign of movement on human rights by the regime it was decided to attempt to try to have a ‘new beginning’ with Eritrea. In May 2007 President Isaias visited Brussels and was “warmly welcomed” by the Development Commissioner, Louis Michel. In the light of the talks that were held the European Commission altered its stance towards Eritrea, as the internal report made clear. Instead of the making improvements to human rights, the Eritrean government ensured that Dawit Isaak remained in jail, as did the other political prisoners. 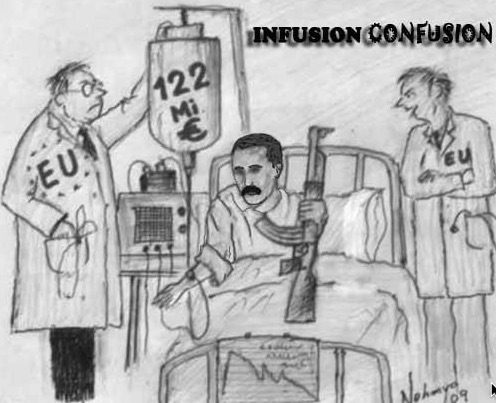 There was no softening in President Isaias’s stance, despite the aid that the EU was delivering. Despite this the EU pressed ahead with its ‘renewed engagement’ strategy. Brussels had learnt nothing from the mistakes made following the 2001 withdrawal of its ambassadors. Asmara, on the other hand, had learnt that if it remained obdurate European politicians and civil servants would, in time, give in to its demands. President Isaias was determining the agenda and had no intention of softening his stance on his people’s democratic rights. On 2nd September 2009 the EU and Eritrea signed a Country Strategy for 2009 – 2013. This acknowledged the impact of Eritrea’s 2001 crackdown on dissent, albeit in diplomatic language. “From 2001 to 2003, there was a slowdown in EU-Eritrea development cooperation, and the Political Dialogue process witnessed the emergence of substantially divergent views on developments in Eritrea and the Region.” The report talked about “limited” political dialogue, but said that regular meetings were planned. At the same time the delegation was able to report that the situation had improved in recent years and funds had begun to flow once more. Buoyed up by an apparently more positive situation the EU Development Commissioner, Louis Michel, opened talks with Eritrea. By August 2009 he was sufficiently encouraged by his discussions to visit Asmara, after receiving assurances from an Eritrean diplomat that Dawit Isaak, would be released into his care. Having booked a ticket for Dawit to return with him to Europe, Louis Michel left for Asmara. But once he met President Isaias it became immediately apparent that the President had no intention of allowing Dawit to go free. Indeed, Mr Michel was not even permitted to visit the prisoner. Despite these setbacks the EU has remained wedded to attempting to secure its relationship with Eritrea. It is noteworthy that in October 2009, despite the fiasco surrounding the Louis Michel visit, European foreign ministries were prepared to take a considerably softer line towards Eritrea than their American counterparts. A US diplomatic cable, released by Wikileaks, reported how one European representative after another called for restraint, while opposing extending sanctions against the Afeworki regime. Despite the American concerns the EU pressed ahead with its strategy: a strategy in which it had little faith and which its representatives described as ‘useless’. It remains a strategy that has never been publicly acknowledged or openly discussed. The document then elaborates on how this would be achieved. The Framework also declared that it was committed to involving what it describes as the “large Horn diaspora living in Europe” in the achievement of these goals. In line with these policies it was decided to provide Eritrea with aid worth €122 million between 2009 and 2013. Since the Strategic Framework was drawn up the situation inside Eritrea has gone from bad to worse. This has driven Eritreans into exile in record numbers. Although the EU continued to raise the human rights situation in Eritrea under its Article 8 dialogue, there has been no progress on the release of political prisoners, the implementation of the Constitution or on freedom of expression. The country remains a one-party state, locked into permanent repression. The United Nations Human Rights Council’s rapporteur on human rights in Eritrea, Sheila Keetharuth, made it clear in her 2014 report that there was no improvement in the situation and that: “The violations described in the present report are committed with impunity.” As Ms Keetharuth made plain, she received no co-operation from the Eritrean authorities in carrying out her mission and was repeatedly denied access to the country. So concerned has the international community become at the situation inside Eritrea that in June 2014 it took the rare step of establishing a Commission of Inquiry into the country’s human rights. This initiative received the support of all EU member states. This is the background against which any consideration of a “new engagement” with Eritrea must be judged. The following lessons can be drawn from the EU’s previous attempts to build a relationship with the regime. 2) Repeated attempts to win over the regime have ended in failure. Past promises of reform, made by Eritrean diplomats, carry no weight. The political prisoners remain in detention, democratic rights are denied and there is no freedom of conscience or religious expression. Rather, as the EU’s experiences in 2001 and 2009 indicate, any softening of pressure is regarded by President Isaias as a sign of the weakness of international resolve. The regime believes it can out-last any external criticism. 3) Promises of aid and international assistance have not resulted in any softening of this stance. 4) Achieving a ‘new engagement’ with Eritrea without seeing concrete, verifiable changes in the policies and practices of the regime would require abandoning the human rights agenda that is an integral part of European development policy. Background Note on Eritrea, October 2008, Directorate-General for external policies of the Union, Directorate B, Policy Department.